Located in a cast-iron building in the Chelsea neighborhood of Manhattan and designed by world-renown interior design firm, Carlyle Designs, The Ammon Carver Studio features a sleek interior combined with a classic loft style. The fully functional photo shoot and event studio is available to all clients and industry professionals for very competitive booking rates with full salon services including complete hair preparation capabilities; as well as flexibility of space and furniture layout for optimal event settings as needed; photo shoots, special events, art galleries, castings and more. The Ammon Carver Studio serves to fill a need in the marketplace for a space that unites the worlds behind and in front of the camera, by creating a cohesive space for both. “I wanted to create a space that marries both the salon and photography worlds.” - Ammon Carver. 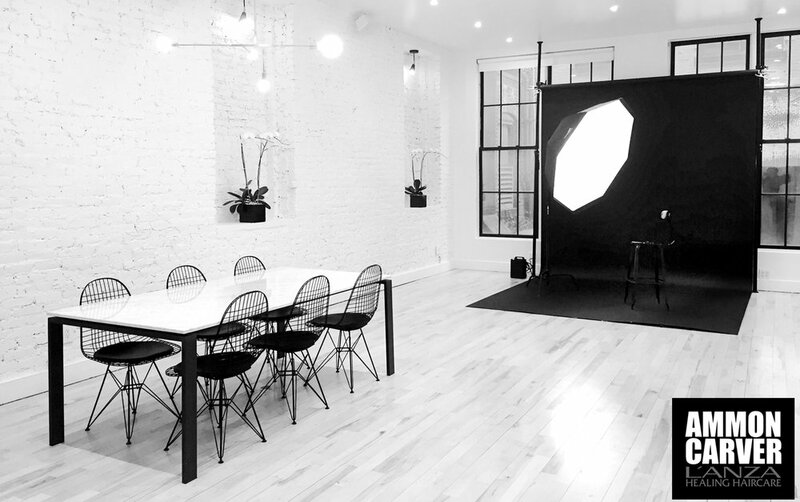 Space Available for Casting, Meetings, Photo Shoots, Fittings, Profile Pics, etc. with discounts on hair services when booked together” Please call to schedule this service.